Few artists can weave an exquisite tapestry of electronic and psychedelic sounds quite like Psymbionic. When he’s not busy running the ring at Gravitas Recordings, the esteemed indie label which houses the likes of CloZee, Au5, and Mr. Bill, its a wonder how John Burcham finds time for anything else. But somewhere along the way, and in the midst of a relentless touring schedule, he’s managed to craft another beautiful sonic masterpiece. Psymbionic has already been releasing tracks from the album since last December, including “Dimensions,” “Edge of the Earth,” and his collaborative track with ProbCause, “Homesick.” Now he’s finally unveiled his second full-length studio album in the 10-track effort, Carbon Based Lifeform, out now on Gravitas. Following his razor-edged debut Vision LP in 2016, Burcham took a year off to mindfully envision the sophomore project, which he says has been a huge growing experience for him. This isn’t your typical run-of-the-mill collection of tracks that get easily strewn together, which is an all-too-common tactic used in today’s dance music landscape, born out the constant pressure to release. 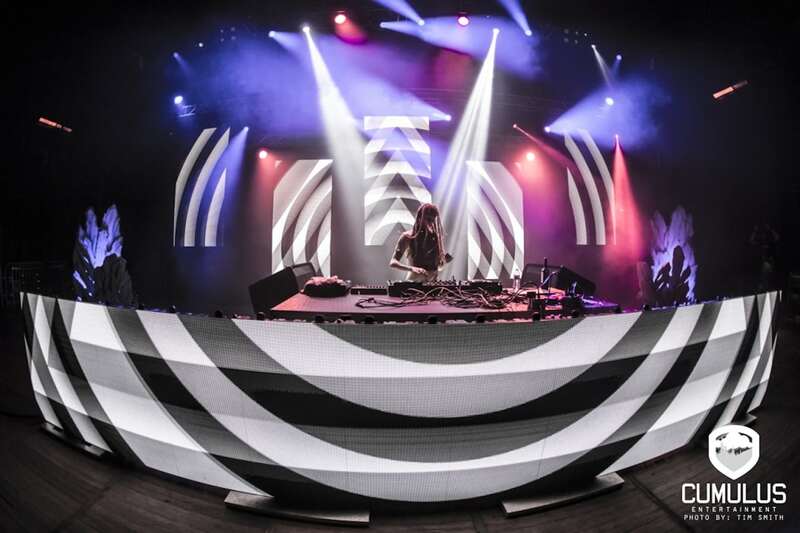 In fact, Psymbionic made sure to create a continuous mix of the album on SoundCloud to encourage fans to experience Carbon Based Lifeform in its entirety, rather than as a quick set of one-off listens. Such is the strength of being your own boss at your own label. It’s the reason more and more artists, especially in the dance music industry, are seeking out independent labels for releasing their hard-fought works of art. Rather than facing big label pressures to conform to a cookie-cutter sound, a move that typically results in projects that are bland and unimaginative, Psymbionic goes in the opposite direction. He takes creative risks, leaps of faith, pursues collaborations that are near and dear to him—and it shows. Take the opening track, “Horizon,” which begins as a synthetic orchestral arrangement that transports listeners into his futuristic, psychedelic world. One actually feels as if they are entering into the Daft Punk-arrangements of Disney’s Tron. It’s a trippy half-tempo exploration of world music that urges one to match their resting heartbeat to the music, steadily taking listeners through a sort-of sound guided meditation. Rising tempos and the introduction of Glitch Mob-inspired synths then enter into the soundscape, working to raise one’s vibration and heart rate accordingly, before ending with those exotic eastern strings. As listeners enter the album’s midpoint, with energetic psybass numbers like “Hypnotoad” and the LP’s title track, “Carbon Based Lifeform.” It is in this track where Psymbionic takes us deep into the world of hard rock, complete with heavy metal guitar riffs, arpeggiated chords, and clashing symbols. The Gabriel Guardian-assisted single honestly feels like its straight out of an AC/DC album. Careful and precise, yet dripping with fluidity and flow, Carbon Based Lifeform is abundant with meticulous sound design that straddles multiple electronic genres. The album is a sonic symposium speaking to Psymbionic’s craft, his intelligence, and his talent for painting a larger visual narrative purely through sound. When listened to in succession, the album takes listeners on a journey through space and time, and deep into the peaks and valleys of Burcham’s complex mind. This most exciting part of the album release is a forthcoming companion comic book that is in the final stages of completion. Written by Burcham himself, and illustrated by visual artist Guzumaki, the two build a comic book universe around Carbon Based Lifeform. “My intention is for my album to be the soundtrack of this story,” says Burcham. The comic book accompaniment will eerily parallel our current technologically-burdened day and age. Burcham describes it as “an ongoing story based around a technologically advanced society that has lost all knowledge of the technology that powers their lives.” Such a social commentary is the mark of any good graphic novel, so Psymbionic has clearly hit the mark on this one. 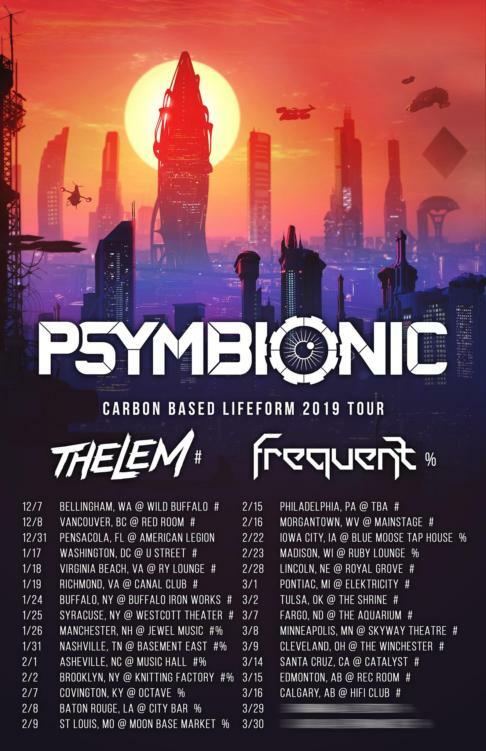 Psymbionic has already been on the road with his Carbon Based Lifeform 2019 Tour, in support of his new LP. He will hit 30 US cities throughout spring, with support from Thelem and Frequent. Check out the full list of cities below and snag tickets on Psymbionic’s website.